This beautiful lakeside resort is located in Reynolds Plantation, a prestigious luxury community situated between Atlanta and Augusta, Georgia. Most notable for its golf, spa and water activities, this Four-Star property has several fulfilling activities to keep you satisfied. Play a round on one of five signature links, or if you prefer your activities to be a little more aquatic, head down to the lake to borrow canoes, kayaks, Schiller water bikes, yolo boards and motorized boats or simply fish along the banks of the resort or from the docks. If you prefer a little less action, a small beach with comfortable lounge chairs, towels and umbrellas is also available. A newly expanded outdoor pool and Jacuzzi is located near the lake, too, for your further enjoyment. Stop by the Four-Star spa to round out your day of relaxation. 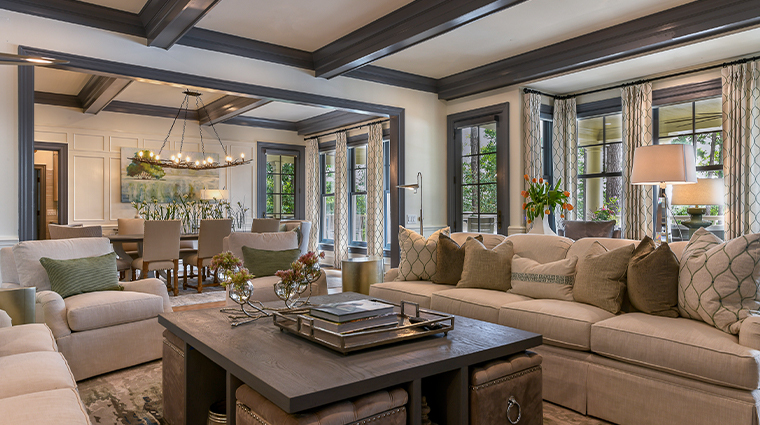 The design of the property is reminiscent of the turn-of-the-century Craftsman and Adirondack movements with Lake Oconee offering a romantic backdrop. 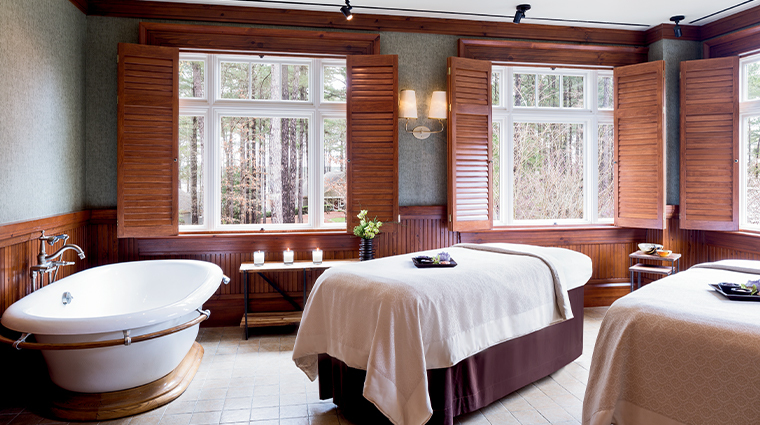 The lakeside hotel’s Four-Star full-service spa features luxurious treatment rooms, separate men’s and women’s tranquility lounge, dry sauna, steam room, cold-water plunge and access to the hotel’s indoor lap pool. You’ll receive special golf privileges at five signature courses designed by Jack Nicklaus, Rees Jones, Tom Fazio and Bob Cupp. You won’t go hungry at this Georgia resort with seven restaurants and grab-and-go options to enjoy. From June to September, enjoy live music and fireworks by the lake on select evenings. Check with the hotel prior to your stay to see who will be in town. You will notice a $49 resort fee on your bill (per room, per night), but it covers valet parking, Wi-Fi, shuttle service, resort activities and more. The five onsite golf courses offer a taste of the South with Georgia oaks, flowering dogwoods, fragrant magnolias and the waters of Lake Oconee perfectly situated around the holes. Furry friends are welcome at this luxury Georgia resort where they’ll receive a VIP (Very Important Pet) welcome amenity upon arrival. A portion of the $150 pet fee goes to the local Humane Society. Couples looking for a memorable wedding venue will be happy to know that the resort's Pavilion is scheduled to open April 2018. The 6,000-square-foot, open-air space will feature exposed beams, light wood walls and a gorgeous stone fireplace. This resort features a variety of accommodations including guest rooms, suites, lakeside cottages and the presidential house. Each accommodation showcases custom-designed furniture and traditional décor. Bathrooms feature marble soaking tubs with separate rain-showers, double sinks and luxurious Asprey amenities. No matter which accommodation you choose, you’ll be rewarded spectacular views of the gorgeously manicured grounds, the lake, or both. Club-level rooms come with the added luxury of Club Lounge access. This fifth-floor space, open from 7 a.m. to 10 p.m., offers a warm lounge environment, a dedicated concierge, complimentary alcoholic beverages and all-day bites (including the scrumptious, Club Level-only white chocolate and blueberry cookies). Georgia’s is the resort’s signature restaurant serving up regional fare with a deep southern influence in a comfortable, relaxed space for breakfast and dinner. If you’re craving a juicy side of beef, make your way to Linger Longer Steakhouse. Enjoy American-style fare like lobster bisque, a variety of Black Angus and dry-aged steaks and the restaurant’s signature soufflés. Gaby’s by the Lake is the super casual waterfront eatery serving up pizzas, salads, sandwiches and signature cocktails all day long. On the weekends, you’ll find a lunchtime taco cart and a full menu of cigars is available for some post golf relaxation. 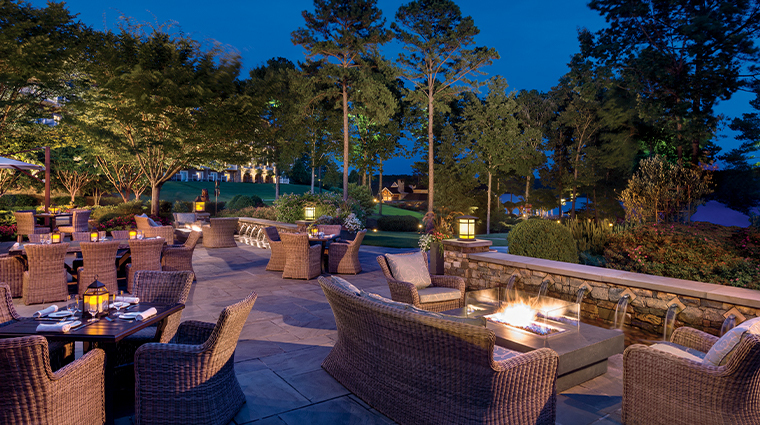 There are two exceptional and unique dining experiences offered by the Lake Oconee property that are a must-try. 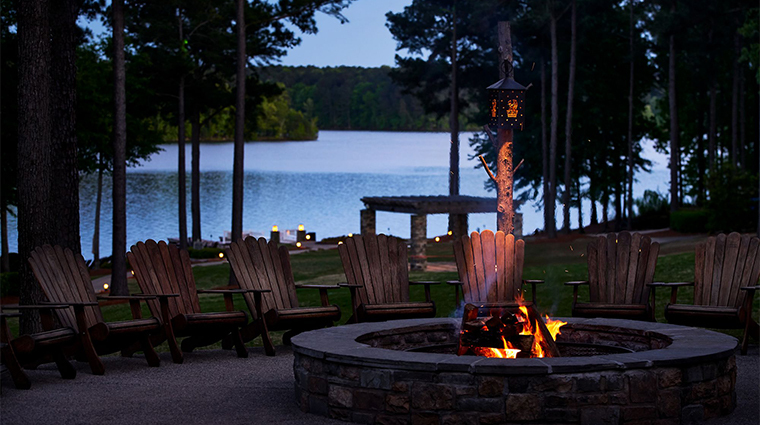 Chiminea dining includes a three-course meal al fresco with a bottle of wine by a roaring bonfire, while the BBQ Butler serves up southern fare in any venue you desire.